This machine has advantages of simplified operation, smooth, fine and bright tablet surface, saving accessories and convenient maintenance. 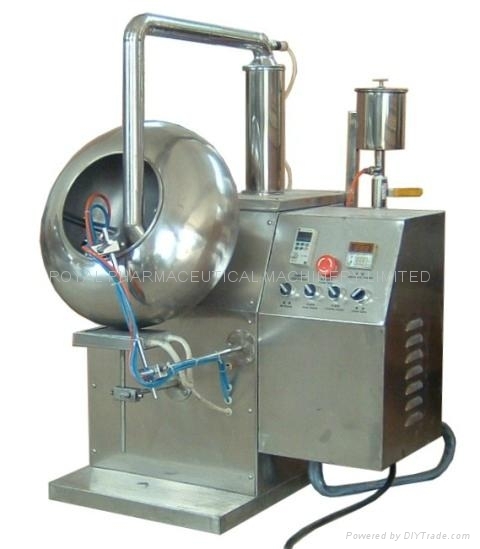 This machine is used to carry out sugarcoating and film coating to the core of Chinese Traditional and Western Medicine tablets, it integrates strong power, weak power, hydraulic and pneumatic. It is a new type equipment improved on the basis of original common type sugarcoating machine. It is composed of the mainframe (original sugarcoating machine), controllable normal temperature hot air system, automatic fluid supply and air supply spraying system, etc. The speed can be controlled, the coating accessories using high atomization spray to tablets surface by the method of automatic electrical control. Meanwhile, the tablets make continuous and complex track movement in the coating pan, let the coating fluid cover the tablet core evenly, the controllable normal-temperature hot air in the pan will dry the tablets at the same time, let the tablet rapidly form a firm, fine, complete and smooth surface film.